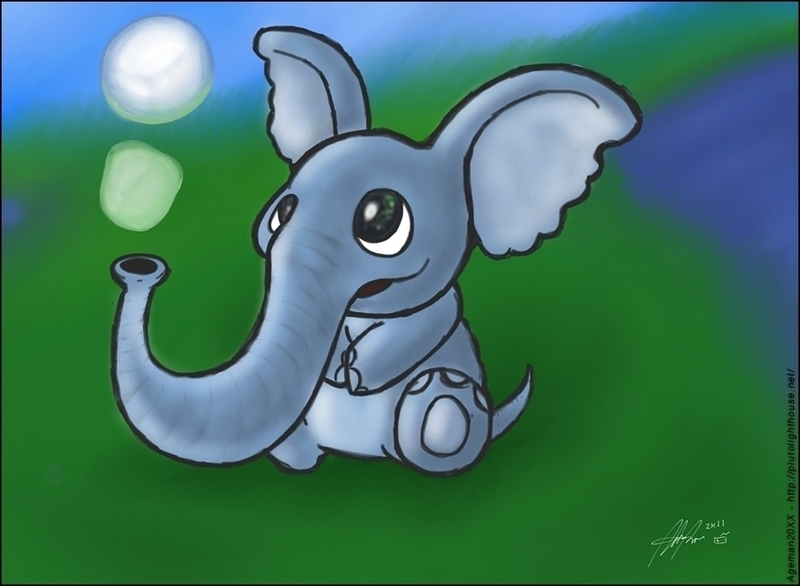 This is a quick and simple image of a cartoon baby elephant blowing bubbles out of his trunk... in a field. Yes, it's very random but I needed something quick and easy to draw and this is what I came up with - it's cute I guess? The real purpose of this picture was to test out the drawing capabilities of my new iPad 2 and Targus Stylus combo. I'd been waiting so long to afford this kind of drawing-on-the-screen tablet experience and while I've come close at times in the past (iPhone, DS), the solutions were often less than ideal or limiting in some way. This, however, is fantastic. Oh, I guess I should also name-drop the app I used - it's called Procreate and its amazing. I'd used Sketchbook Mobile before and while it has almost all the same features (maybe more), the drawing experience just felt more elegant in Procreate. As for the random, blue, bubble-blowing elephant itself? I think it looks a bit silly and pointless, and the illustration could look better, but the lineart is so crisp and the shading and vibrancy and overall quality of the image look very high even though it was quick and easy to accomplish. I feel like I'm being a brand-whore here, so I'll concede that any kind of tablet-device could create this level of quality (and much, much better as they included examples can attest) but I'm still kind of floored at the possibilities of this little device and combination of software. I'm excited to draw so much more!